David Pascual, 15, adds a part to a robotics project during class Monday, September 4, 2017 at Sharyland High School in Mission. Sharyland ISD is now an open-enrollment district. MISSION — In a somewhat uncommon approach to resolving a potential enrollment decline, Sharyland Independent School District officials recently opted to marginally open the door to out-of-district students for the first time in about 15 years. The one caveat: a $2,500 annual tuition. This week, the Sharyland ISD Board of Trustees approved a plan that allows the district to become an open-enrollment district under the condition of a strict application process and tuition charges. Sarah Chandler, center, 16, asks her Physics teacher Angie Culberson-Espinosa a question as Gabriella Martinez, left, and Miranda Cantu, right, both 16, listen during class Monday, September 4, 2017, at Sharyland High School in Mission. Sharyland Independent School District is now an open enrollment district, but incoming students must pay tuition to attend. 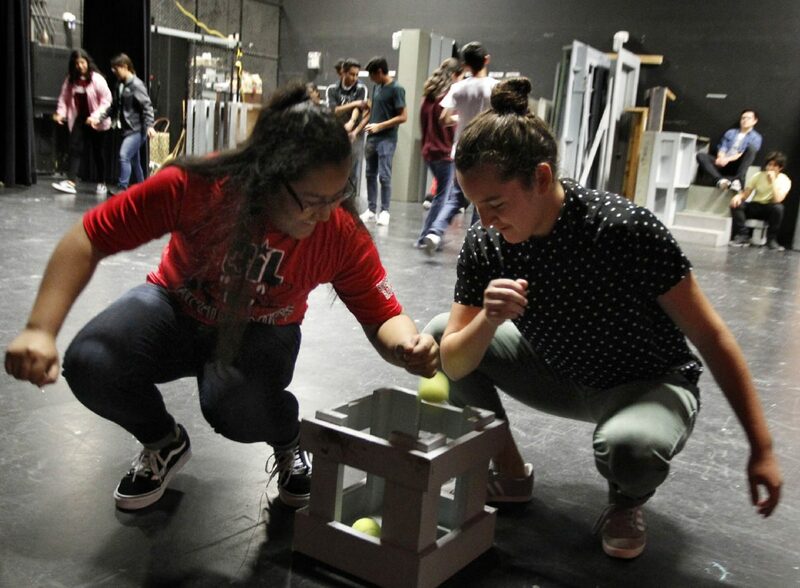 Karla de la Fuente, left, and Faith Gonzalez, both 17, drop a tennis ball into a box after they held it using only their forearms during their theater class Monday, September 4, 2017, at Sharyland High School in Mission. Sharyland ISD is now an open-enrollment district. 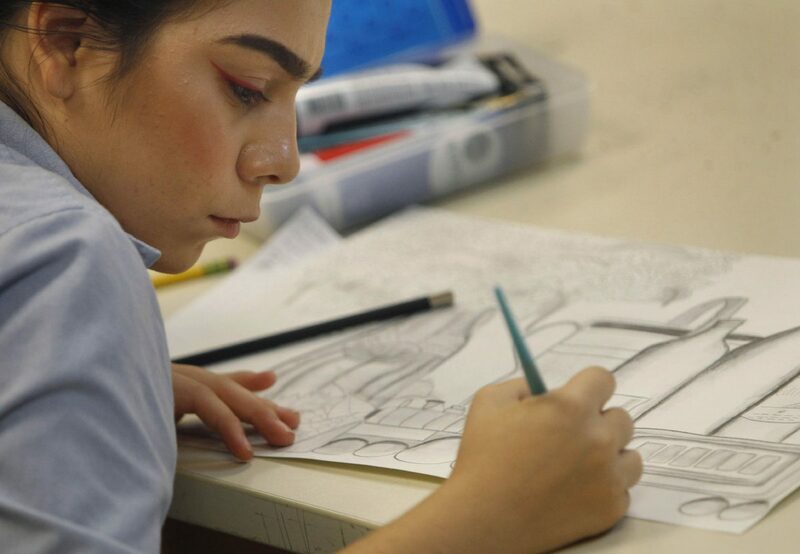 Salma Valdez, 17, works on a still-life drawing during art class Monday, September 4, 2017, at Sharyland High School in Mission. Sharyland ISD is now an open-enrollment district. The district’s main concern will continue to be serving students from within its district boundaries, he explained, so there will also be a limit on how many additional students can be accommodated in each grade level. Transfer students will also be placed in schools selected by the district, and parents or guardians must agree to provide transportation. The applications to join the district with an enrollment of approximately 10,000 students will be reviewed by administrators, as students must show clean records as far as attendance and discipline, as well as high scores. There will be a set fee of $1,250 each student per semester. This, O’Connor noted, is a way to ensure that the students the district would be willing to accept are academically prepared and driven. Compared to neighboring districts in Hidalgo County, Sharyland is in a unique situation being the only one that, up to now, has remained a closed-enrollment district. Most school districts in the surrounding areas not only have open-enrollment but are fiercely competing for students with public school districts and charter schools. For instance, the neighboring Mission Consolidated Independent School District — which enrolls about 15,700 students — has maintained open enrollment both within the district, as students can transfer to different schools within the district, and also those outside its limits. To control overflow, however, there is a cap on the number of students allowed to transfer per campus. Even as the two districts serve the city of Mission and other surrounding areas, the demographics of each area are different. Mission CISD has a total of 83.8 students considered economically disadvantaged, while Sharyland ISD has 60 percent of its students under this category. In the case of Mission CISD, Lopez said charging tuition would not be an option as he believes that if parents were to pay it would more than likely be for a private school. Sharyland school district officials have noticed a decline in enrollment in recent years, mainly for elementary school grades and below. This means there are not enough young families moving into the district boundaries, which is not an unexpected occurrence, according to Carolyn Mendiola, assistant superintendent for student services. A recent demographic study showed homes in the area are mainly occupied by older families and there is an increase in senior housing developments. Even as the enrollment is stable at the moment, Mendiola and O’Connor said they know that as the smaller elementary classes go up the latter, they might have a decline in overall enrollment. Testing alternative options to keeping the district mostly closed, as far as enrollment, is more of a proactive approach, they said. Just as they adopted this new initiative this year, the approach might change in the coming years as they weigh options on how to better market the district to fill in those gaps. Even as the district will be carefully screening applicants, a common point of judgment when it comes to charter schools selecting students, O’Connor assured transfers with high academic achievements will not take precedent over in-district students, as these will remain their priority regardless of their record.